Routes can be customized by dragging them on the map. Hover the cursor over the route and wait for a dot to appear. Click on the dot to grab the route and move it. Dragging the route will create a via waypoint. This can be useful for quickly adjusting where a trip will go. For example, there may be a certain highway you want to take (or avoid). 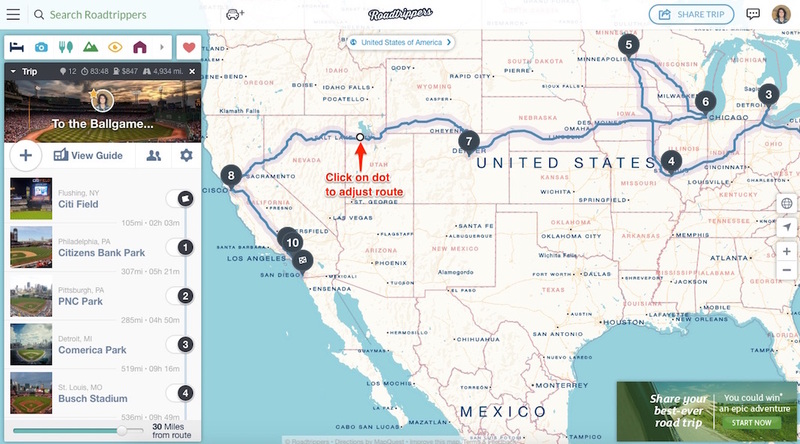 Drag the route off (or on) the highway for quick and easy customization of the trip. Dragging is also useful if there are general areas you want to travel through, but not a specific place or stop. Hey Grant, this feature may be coming soon to our trip planner. Feel free to add this as a feature request in the meantime here: https://support.roadtrippers.com/hc/communities/public/topics/200077913-Feature-Requests so others may vote for it! Can you do this on the app? I can't seem to figure out how to adjust my route so that I take PCH instead of the 5 for my trip up the west coast. Hey Linda, currently routes cannot be changed or modified within the app. However, many of our Web app features will be making their way to our mobile app soon so stay tuned! Have noticed issues w/Roadtrippers.com not loading successfully with IE9 - are there known issues with IE9? how do i delete these dots? i have a few of them guiding my drip into nowhere. i was messing with them testing them out and made a mess. am i stuck them now? Hi Alyssa. We’re sorry you ran into a problem using the site. Can you email us at support@roadtrippers.com with your issue? Our team will take a look into your problem.